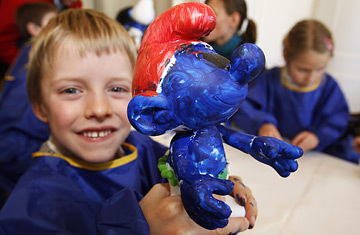 A child paints a white smurf at one of the events planned for the 50th anniversary of the Smurfs. The invasion has started. The announcement went out from Brussels, which became command central on Monday, directing thousands of tiny plastic Smurfs to head not only into the streets of Brussels itself but into Paris and Berlin, in a massive United Nationsapproved campaign. Well, approved by the United Nations Children's Fund (UNICEF), that is. It is all part of the 50th Anniversary of the blue-skinned creatures, whose nearly all-male society has fascinated children and adults all over the world, infecting languages everywhere with the verb "to smurf"  which can mean almost anything you want. Above it all, a Smurf zeppelin patrols the skies. They may only be "three apples high," but the cheeky, blue-skinned Smurfs have left a giant footprint on the world since first appearing in a humble comic strip half a century ago. Since then, they have become global cartoon stars: they have appeared in video games and had theme park attractions devoted to them. In total, more than 300 million tiny plastic Smurf figurines have proliferated around the world. And now these white-capped, blue dwarfs are getting set for the silver screen: Paramount Pictures is currently developing a CGI 3D Smurf feature through its Nickelodeon Films unit that would bring the mischievous creatures to a whole new generation (the currently untitled movie is tentatively scheduled for a 2010 release). In parallel, IMPS (International Merchandising, Promotion & Services) which runs the Smurf empire, is working on its own new cutting-edge animation that could revive the dormant television series once again. The Smurfs, or Les Schtroumpfs as they were originally called in French, first appeared in October 1958 in the Belgian comic magazine Spirou. They were created by the Brussels-born cartoonist Pierre Culliford  better known as Peyo  and were originally mere supporting cast in his medieval Johan and Pirlouit series. Peyo said the word came to him when he asked a friend for salt during lunch and, struggling for the word, just blurted out, "pass me the schtroumpf." The same process triggered the Smurf language, which uses the word "smurf" to replace nouns, verbs, and everything in between, with predicable confusion: "I feel like smurfing you on the smurf" could mean either "kissing you on the cheek" or "hitting you on the head." It was Peyo's wife, Nine Culliford, who chose the color. "They couldn't be green  they would have vanished in the vegetation. Red would have been too flashy and yellow a bit unfortunate. Only blue was left!" she said. The creatures proved popular enough for Spirou to give them their own series in 1959, and over the years Peyo published 16 albums, and developed an animated movie in 1975 that featured music by Oscar-winning French songwriter Michel Legrand. However, the Smurfs did not emerge as global icons until the advent of the Hanna-Barbera animated cartoon in 1981. The Emmy-winning series (it won for Outstanding Children's Entertainment Series in 1982-1983) ran for eight seasons on NBC, producing 272 half-hour episodes and earning a 42% share of the U.S. Saturday morning audience. The cartoons sparked a merchandise bonanza, and about 3,000 products and services have used the Smurf brand image, from McDonald's to VW, Coca-Cola and Kellogg's. Candy maker Haribo has sold more than 6.5 billion of its jellied Smurf sweets over the past two decades, while over 10 million Smurf CDs have been sold in the last three years alone. There was also a traveling ice show, a France theme park called Big Bang Schtroumpf (as well as Smurf attractions cropping up in five U.S. and Canadian theme parks), and the smash hit The Smurf Song by Dutch singer Father Abraham reached No. 1 in 16 countries back in 1977. In recent years, Smurfs have had to endure online accusations that they were closet Communists, as they share everything in their idyllic village, wear the same uniform, and sing the same catchy song. And there is even a theory that their sworn enemies  evil wizard Gargamel, along with his mangy cat, Azrael  represent international capitalism. Peyo's family fiercely denies this and insists the stories are apolitical. But Peyo did use the Smurfs to satirize Belgium's endless language wars between French and Dutch speakers: in one album, he divides the village into two halves that fight over whether the term "smurf" should be used as a verb or as a noun. Peyo died in 1992, but his studio continues to live on, producing comic books, and has started to tackle more modern themes. The tribe, which originally numbered 100, had to wait nine years before it met its first female, the Smurfette  although more girls have been promised in future albums. And in the wake of the revelation by Harry Potter author J.K. Rowling that Dumbledore was gay, Nine Culliford has hinted at a similar outing amongst the Smurfs. "Well, I did tell my husband that Vanity Smurf was like that, and he said, 'I never thought about it, but you're right,'" Culliford said. "Who knows? Maybe in a few years we'll be able to say something like that about him."